I have just been interviewed for the first time. How cool is that? I will tell you, pretty freaken cool! It was so fun, and John was so patient with me. Sharon is a native of New England but now resides in North Carolina. She is married with 1 son. She is owned by a flock of 8 birds and 2 hamsters. 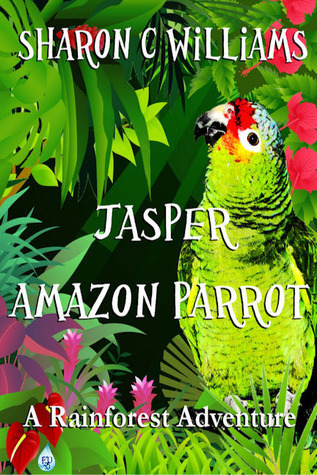 She is working on her first MS which is a children’s book based on her Amazon parrot Jasper. What is the current project you are working on? I am working on my first MS, it’s a children’s book. 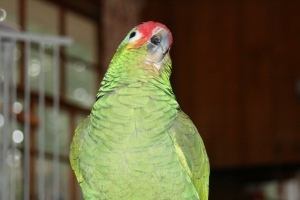 It is based on my Amazon parrot Jasper. It is set in the Amazon. What inspired you to become writer? My husband told one of my friends that I wrote really well. A year or so after I started thinking of a story in my head and it would not go away. Later that year I had 2 surgeries within 3 months of each other( not related). Having time to recover, I decided to put my thoughts on paper. I have been writing ever since, from short stories to full blown books. You can write about anything- from personal history to things you know. A writer can make up anything with different scenarios that makes their readers think. I have always been an avid reader. The thought that one day I can be one of those writers that bring people joy excites me. What is the worst thing about being one? What is the estimated number of projects you have worked on? I am working on my first MS, in the process of editing and fine tuning it. However, I have a nice collection of short stories. Down the road, I plan on making two of them into a book. Oh an easy question for me- Stephen King. I am from Maine and bias. However, I do love his works. Agatha Christie, James Patterson, Bentley Little and Greg Ilse are other authors I follow. These are the books you will see mostly in my library. However being an avid reader- I read basically anything between two binders. How has your life changed since you became a writer? It has consumed me. I look at things differently now. Before I started writing, I was going through the motions of life. I see things through a different perspective now. Looking at people, I now go hmm how can I make that into a story? I wonder what they are thinking and doing. I use my senses more now. I look at everything as a potential story. For example, I have a long going war with the squirrels in my back yard. I am not a fan. Yet I wrote a short story( I am on page 23 and still going) in 3rd person on what they thought of me. It made me rethink, so yeah my life has not been the same. What is one piece of advice you can give to someone who also wants to become a writer? I know it sounds like a cliche but this has been the best advice I have ever received. Write on what you know. It is really that easy. A writer just needs to know a little tidbit and turn it into a short story or book. I am owned by 8 birds and 2 hamsters. I love to read,take pictures,walk, exercise, go to the movies and listen to music. I am a budding bird watcher and learning to crochet on the side. I run a book club in town but also am a member of one at a local library. I am a huge sports fan. I love baseball, basketball, hockey and football. I like to stay busy needless to say. Have you had any other jobs before you decided to become a writer? How would you describe your education? How would you describe the writing “scene” where you live? There are many writers in my area. In fact, I am a member of 2 writing groups. The need and want is here. How has social media changed the publishing film industry? It helps writers promote themselves. The writers gets to “meet” and talk with fellow writers. Everyone knows writing is a solitary job- the need for social interaction is there. Places like Twitter and Facebook and the likes gives writers a chance to share information and ask question. Ideas can be exchanged and a network is formed. It is so beneficial mentally and emotionally. What is your thought process like when your writing? I lose all track of time. The world could be coming to an end and I would be oblivious to it. When I am writing, I envision the scenes in my head. I try to imaging the reality of what I am writing down on paper. I think of different options, scenes and problems. I will write them down on the side in case I can use them later. I tend to write by long hand- the flow works better for me. It consumes me and I love it. You could have any book in the world. Which would it be? You could be any animal. Which would you be? You could have any super power. What would it be? What is your opinion on book to movie adaptions? Unless the author helps with the screenwriting or does it themselves- then I tend to worry they will mess it up. There have been some amazing movies that have done honor to the book they are adapting from- but it is a hit or miss . You could have any first edition book. Which would it be? Thanks Sharon for doing the interview. I wish you the best of luck with your book. Please let me know when it is published. I’m sure my niece would love to read it. We can’t wait for your guest post at Jimmy the Squirrel: http://amrtaher.tumblr.com/. If someone interviews us, will they insist on Mr. Taher, or do you think Jimmy’s chirps and squeaks will suffice? Hmm that is a good question. Will there be a translator for Jimmy? 🙂 I am excited as well, still not sure what we will be discussing. Congratulations! That was a great interview! Thank you :). It felt good. By the way, I am loving your blog- I know I don’t always get to post a reply but I do read it. Thank you. I am glad you are enjoying it!